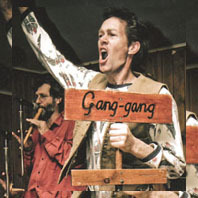 Gang-gang Bush Orchestra have been playing songs and dances of the bush for the past 14 years. We have put this show together especially for the Mid Mts Folk club. A brief history of rebellion in song. From colonial time to the present date: people have not always just gone along with what is happening, complacency has not always been rife. Sometimes you have to stand up and say: "Enough!"